Laminate Works manufactures any kind of laminated panel or part a customer needs. The Kansas City, Kansas, company makes both HPL laminated panels and component parts, and does laminating, edgebanding, contour edgebanding, CNC routing and postforming. Laminate Works manufactures both panels and parts, but not finished products. They don’t sell directly to end users, and will only sell to other manufacturers. Laminate Works was founded in Wichita 16 years ago, and has 80 employees. It has been in Kansas City since 2001 and has a 100,000 square foot operation there. A separate 75,000 square foot operation was started in Dallas, Texas, six years ago. Because of its emphasis on panels and parts, Laminate Works serves many markets, including commercial casework, store fixtures, restaurants, office furniture manufacturers and elevators. In the last five years, the company’s business in office furniture, store fixtures and the restaurant industry has grown, especially with the capabilities of the contour edgebanders. Laminate Works bought its first contour edgebander in 2006. Whatever the market, Laminate Works has been handling shorter runs, and offers regional distribution to serve smaller customers with Laminate Works trucks. Laminate Works uses 20 to 25 press runs a day as a measurement of activity, and usually presses 300 to 600 panels in a shift, largely depending on how thick those panels are. On the Black Bros. glue line a panel pusher moves a panel into a panel cleaner and glue spreader or roll coater. An index station brings in the laminate. When a stack is built up on a scissor lift it is rolled it into one of two cold presses. Both Kansas City and Dallas use Black Bros. glue lines. Equipment includes a Schelling fh4 beam saw and another panel saw. The Schelling beam saw has been the primary saw in the Kansas City location for four years. 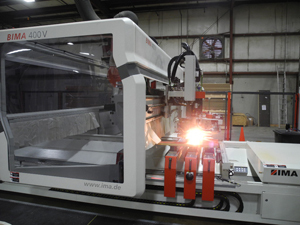 The IMA-BIMA 400V is a contour edgebander that can also be used as a point-to-point. Laminate Works bought two identical BIMA’s, one for Kansas City and one for Dallas. Both were installed last summer. The Kansas City machine was displayed at IWF. “They approached us (and) they truly wanted to create a partnership with Laminate Works, as opposed to selling us a machine. That’s how we go to market, so for me it made all the sense in the world.” Other vendors, he said, were not as focused on a partnership. The company has other CNC routers, a straight-line edgebander and postformer in Kansas City. In the Dallas operation there are five main machine cells: glue line, saw, straight line edgebander, contour edgebander and point-to-point router. Clothier said the focus now is upgrading machinery, expanding capacity at the two locations, and adding a new nested-based router. The company is installing an ERP software system, which will give them more visibility. Sales people will be able to see in real time where the job is.